“Verona” is located in High Street Maitland the region know as “Campbell’s Hill” at the end of the long bridge which is one of main roads leading off the New England Highway. "Verona" is located in the heart of the Hunter Valley just a short drive from the township of Morpeth and minutes from the famous wineries of Pokolbin. This magnificent late Victorian residence circa 1900 for a Colonel William Markwell’s family. It is an exceptional property with grounds, and a family home that blends the exquisite artisan skill from the turn of the century with modern conveniences are of today. Many older locals remember it, as a place who’s who of Maitland would be invited in the daytime and the occasional black tie gathering at night. All proportions are generous and grand formal and informal living areas, which accommodate both entertainer and daily living. Blue Room - 2 x King Singles, Opens onto verandah, including all period furnishings. Full cooked breakfast supplied in Family Room. Green Room - very large guest room, with large double bed. Including open fireplace, bay window, period furnishings. Occhre Room, Large Double Bed. Including period furnishings & fully cooked breakfast. The package includes two nights accommodation and fully cooked breakfast. Verona offers guests an opportunity to experience this magnificent late Victorian residence including formal lounge, family room, library and garage. 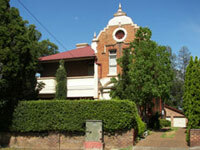 $170 per room per night (twin share accommodation). If the reservation is cancelled within 14 days prior to the arrival 100% of the total accommodation charge will occur unless the room can be re-sold.